Abraham Bosse, the son of a German Calvinist engraver who emigrated to France to escape religious persecution after Henri IV issued the edict of Nantes guaranteeing freedom for Catholics and Protestants alike to worship in France, probably trained with Melchior Tavernier (1564-1641) in Paris and his earliest datable set of prints, a series of 4 landscapes after Matthäus I Merrian, were published by Tavernier in 1629. As Colin Harrison notes in the Grove Dictionary of Art, "whatever their subjects, his prints almost invariably show the human figure in contemporary dress" (4: 467-69; here at p. 468), "making them invaluable evidence for the social historian." 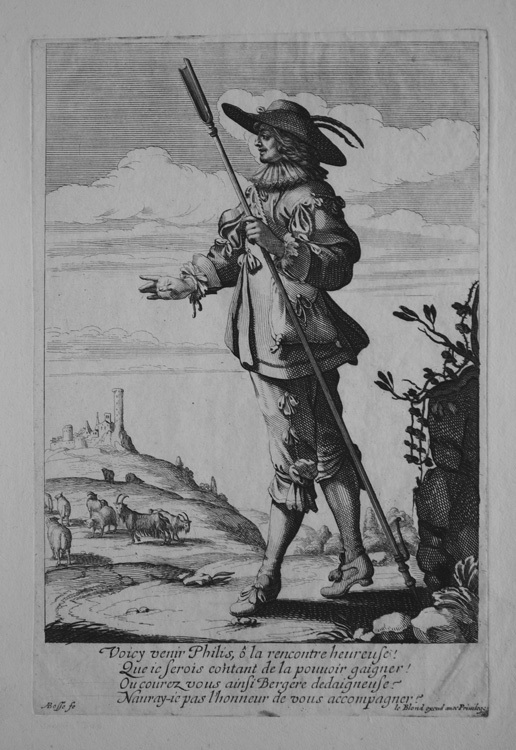 Through his friendships with the geometer Gérard Desargues and with the engraver and etcher Jacques Callot, Bosse became interested in both perspective theory and with the practice of etching, learning from Callot "the Italian manner of etching on a hard ground made from linseed oil and resin." His interest in perspective led him to publish popular editions of Desargues' studies in perspective and in 1648 the Académie Royale gave him permission to lecture on perspective. Ultimately, however, his unorthodox theories on perspective led him to many arguments and to his expulsion from the Académie. In 2004, the Bibliothèque National de France in Paris and the Musée des Beaux-Arts de Tours (where Bosse was born) both celebrated the 400th anniversary of his birth by presenting major exhibitions of his prints, as works that give witness to his age and witness to his extraordinary skill as a printmaker. 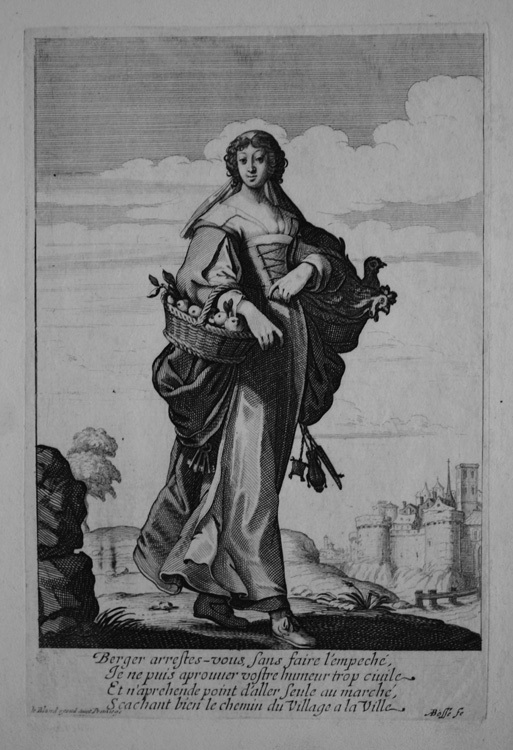 Select Bibliography: André Blum, Abraham Bosse et la Société Francoise au Dix-Septième Siècle (Paris: Editions Albert Morancé, 1924); Marianne Le Blanc, D'Acide et D'Encre: Abraham Bosse (1604?-1676) et son siècle en perspectives (Paris: CNRS Editions, 2004; the recent discovery of his apprenticeship contract gives his birthday as 1604, not 1602 asa previously thought). There is no contemporary catalogue raisonné of his prints (the standard reference is still G. Duplessis, Catalogue de l'oeuvre d'Abraham Bosse [Paris, 1859], which I have not yet seen). Several of his prints are reproduced in Eugène Rouis, La Gravure originale au XVIIe siècle (Paris: Somogy, 1974), pp. 51-56. The work for which he may be best known is the frontipiece for Thomas Hobbe's Leviathan: The Matter, Forme and Power of a Common Wealth Ecclesiasticall and Civil. "This illustration is an Anglo-French work: drawn by a French artist, Abraham Bosse, but designed in collaboration with the philosopher. It shows a giant which represents Hobbes' idea of the absolute state. The text along the top quotes the Latin Bible, from the Book of Job, and describes the monster Leviathan: "There is no power on earth that can compare with him." The giant wears a crown. He rises above a landscape, and wields a sword and a crozier, emblems of civil and church authority. But his most striking aspect is the way his torso and arms are made up of numerous densely crowded little figures. He is a swarm-man" (Tom Lubbock, The Independent, 2/20/2009). Abraham Bosse (French, 1604-1676), The Shepherd. Original etching on laid paper from the first printing, which was published by Jean le Blond (Paris, c. 1594-1666), who was the eldest son of the print publisher Nicolas le Blond I (d. 1610) and who followed his father in publishing prints. In addition to publishing works by Bosse, he also published works by Pierre Brebiette, Israel Silvestre, and others. The exclusive Royal Privilege to publish these printssomething Rubens fought hard to receive and failed for many years to getinsured that no one would try to counterfeit them. Inscribed in the plate "ABosse fe" lower left and "le Blond excud avec Priuilege" lower right. This is part of a set of 4 shepherds and shepherdesses. Image size: 209x145mm. Price $2500; complete set of 4: $8000. Illustrations of the four pieces can be see at http://deyoung.famsf.org/search-collections by entering Abraham Bosse in the search bar. 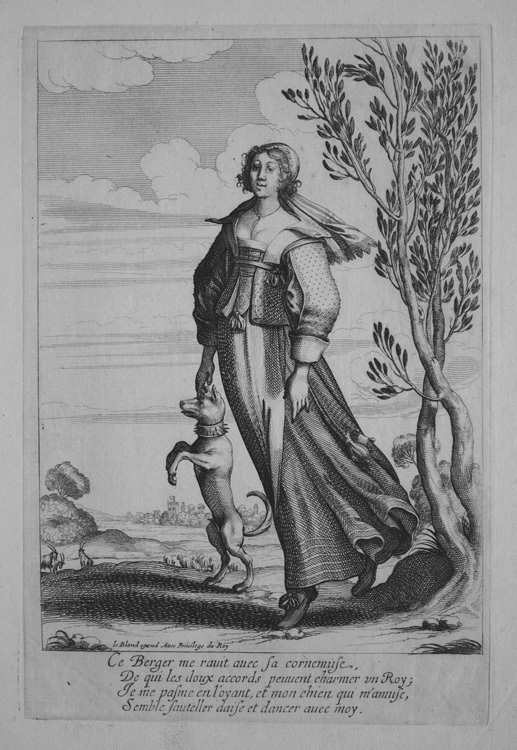 Abraham Bosse (French, 1604-1676), Shepherdess with dog walkinmg on two legs. Original etching on laid paper from the first printing, which was published by Jean le Blond (Paris, c. 1594-1666), who was the eldest son of the print publisher Nicolas le Blond I (d. 1610) and who followed his father in publishing prints. In addition to publishing works by Bosse, he also published works by Pierre Brebiette, Israel Silvestre, and others. The exclusive Royal Privilege to publish these printssomething Rubens fought hard to receive and failed for many years to getinsured that no one would try to counterfeit them. Inscribed in the plate "le Blond excud Avec Priuilege du Roy." This is part of a set of four shepherds and shepherdesses. Image size: 212x143mm. Price $2500; complete set of 4: $8000. Abraham Bosse (French, 1604-1676), Shepherdess rebuking shepherd. Original etching on laid paper from the first printing, which was published by Jean le Blond (Paris, c. 1594-1666), who was the eldest son of the print publisher Nicolas le Blond I (d. 1610) and who followed his father in publishing prints. In addition to publishing works by Bosse, he also published works by Pierre Brebiette, Israel Silvestre, and others. The exclusive Royal Privilege to publish these printssomething Rubens fought hard to receive and failed for many years to getinsured that no one would try to counterfeit them. Inscribed in the plate "ABosse fe" lower right and "le Blond excud avec Priuilege lower left." This is part of a set of four shepherds and shepherdesses. Image size: 212x143mm. Price $2500; complete set of 4: $8000. 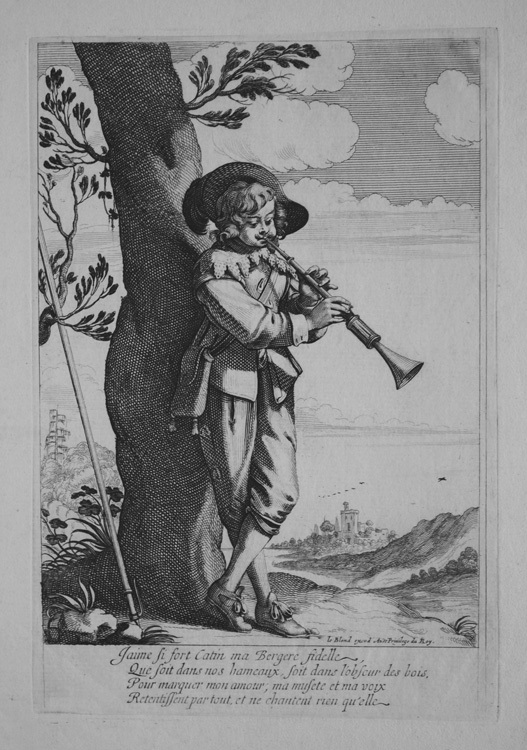 Abraham Bosse (French, 1604-1676), Shepherd with pipe. Original etching on laid paper from the first printing, which was published by Jean le Blond (Paris, c. 1594-1666), who was the eldest son of the print publisher Nicolas le Blond I (d. 1610) and who followed his father in publishing prints. In addition to publishing works by Bosse, he also published works by Pierre Brebiette, Israel Silvestre, and others. The exclusive Royal Privilege to publish these printssomething Rubens fought hard to receive and failed for many years to getinsured that no one would try to counterfeit them. Inscribed in the plate "le Blond excud Avec Priuilege du Roy." This is part of a set of four shepherds and shepherdesses. Image size: 210x145mm. Price $2500; complete set of 4: $8000.